Perched in a landscape that is defined by Monterey Pines and Scottish-style golf links, this Inn is an idyllic retreat that offers mesmerizing coastal views and serene surroundings for total relaxation. 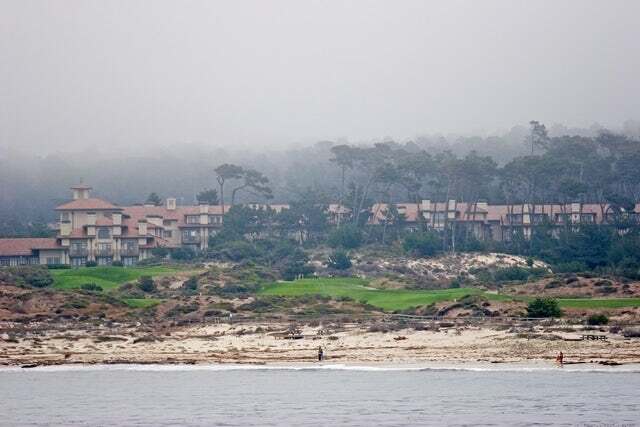 Casa Palmero, Inn at Spanish Bay, and Lodge at Pebble Beach make up what is known as the Pebble Beach Resort. The landscape on which this resort is located is punctuated by dramatic coastlines and mystical forests. The resort proper offers world-beating accommodations, expert professional service, and homely hospitality. This combination makes this destination one of the most popular relaxation hotspots in the West Coast of USA. Among the popular guests to have graced this resort include Teddy Roosevelt, Winston Churchill, Bill Cosby, and more recently Justin Timberlake, Bobby Jones and Tiger Woods. Ask yourself this – what is it that this rich and famous guys saw in the resort? Well, below is what enticed them. Accommodations at this resort are to be found in three categories. The first one is the 161 rooms and suites Lodge at Pebble beach. The enchanting lodge offers stately rooms and attentive hospitality. The other accommodation is to be found in the Inn at the Spanish Bay and the third one is in Casa Palmero. Now let’s delve into what you will get at the Inn at Spanish Bay. This Inn has distinguished itself by offering contemporary elegance and world-class services. Perched in a landscape that is defined by Monterey Pines and Scottish-style golf links, this Inn is an idyllic retreat that offers mesmerizing coastal views and serene surroundings for total relaxation. With a total of 269 guest rooms and suites, you can be assured that your accommodation needs will be well taken care of. The rooms are divided into different categories depending on the views they give and the number of amenities you can expect. These includes; Garden View, Forest View, Scenic View, Ocean View, Executive Suite, Honeymoon Suite, Governor's Suite, presidential suite and Spanish Bay Suite. The Inn strives to create a cozy feeling that attracts lovers, spouses and honeymooners. It features rooms that have private balconies, cozy fireplaces and elaborate and lavish furniture. From the comfort of your room, you will get the enchanting views of the pine forests, golf fairways, and landscaped gardens. The rooms are fitted with modern bathrooms, high speed Wi-Fi internet, and flat screen TV's. A number of restaurants are available near the Inn including the Pèppoli at Pebble Beach with its northern Italian cuisines, Roy's with Hawaiian delicacies, Sticks with its food and sports, and Lobby Lounge for full cocktails. Among the recreational activities you can engage in at the Inn includes; playing golf at the Scottish links, shopping at the Inn Retail Arcade, workout at the fitness center, and playing tennis at the Tennis Pavilion. Contact us today and we will get you packing.